It’s Time to Raise the Roof! Most homes today are built with pre-fabricated trusses. There are several advantages to using pre-fabricated trusses including having to use fewer load bearing walls and cost savings due to less framing labor and time. One of the major disadvantages to standard pre-fabricated trusses, however, is the fact that they limit the amount of insulation that can be installed in the very corners of the home. This of course reduces the energy efficiency of the home and contributes to higher utility bills. One solution to this problem, as is currently used on every home by UpDwell Homes, is to use raised heel trusses. Raised heel trusses are engineered using advanced techniques to meet or exceed current building codes. Raised heel trusses are different from standard trusses because they are fitted with a heel where the bottom chord intersects with the perimeter wall. This then raises the top chord creating a larger area where the truss meets the wall. The main advantage to raised heel trusses is they allow for more insulation to be placed in the area where the truss meets the wall and allows for insulation to be extended right to the outside of the top plate. This area is typically where much of the heat escapes from a home during the winter. 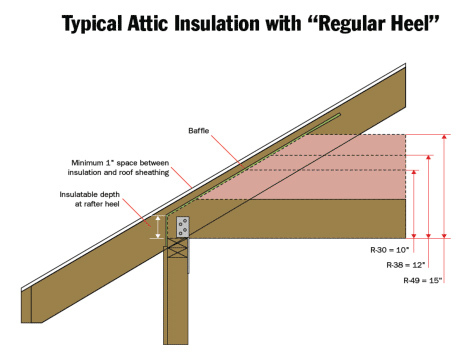 Using a raised heel truss with increased amounts of insulation will help reduce the amount of heat escaping from this area and can result in substantial savings on utility bills. Raised heel trusses also help prevent ice dams. Typically, ice dams can occur when heat escapes and melts snow that has accumulated on the roof. This process creates pools of water which can then freeze when temperatures drop during the night. If these ice dams are left untreated the ice can expand under shingles and contribute to leaking roofs. Adding the extra insulation that is allowed by the addition of raised heel trusses helps eliminate these ice dams and the resulting issues. So, when choosing a home builder be sure to ask about the measures they are taking to increase the energy efficiency of their homes. Builders like UpDwell Homes use techniques such as raised heel trusses to increase the energy efficiency of their homes to help home owners save hundreds and even thousands on utility bills annually. Just What is the Draw of Heber City Utah? How Do Mortgage Interest Rates Affect Your Monthly Payment? What is the Value of Energy Efficiency? What is the Living Triangle?